Ernest Doe have been involved in professional turf care machinery since the 1960s and is the largest distributor of Ransomes Jacobsen turf care machinery in the UK, stocking turf care machinery for all types of large turf applications including municipal, amenity, golf and sports ground use. As a Ransomes Jacobsen turf care machinery dealer we offer technical, servicing and parts support and can advise you on the best machinery and attachments for your application. 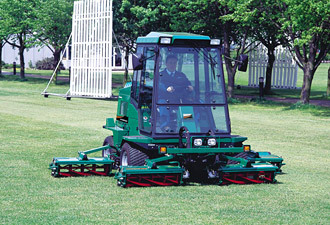 The Ransomes name in the UK is renowned for a legacy that spans three centuries. Mowers have been built at their Ipswich manufacturing facility since 1832. The Ransomes brand is synonymous with rugged, robust and extremely reliable mowing equipment that delivers superior levels of productivity, season after season. From parks and sports grounds to highways and fine lawns, there is a model for everyone. 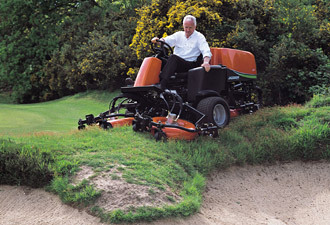 The range of municipal mowers provides best value for each and every customer. The full range includes Marquis and Matador walk behind mowers, Parkway and Highway cylinder mowers, HR multi-deck rotary mowers and mounted and trailed units. For more than 85 years, Jacobsen have manufactured a full range of superior turf maintenance equipment for the golf green keeper. These are precision engineered machines with carbon steel cylinders for durability. A smooth, uniform finish for greens and fairways is ensured via electronically balanced cylinders and easily adjustable cutting blades. Jacobsen fairway mowers are also designed to minimise damage to delicate greens, by being the lightest machines in their class – resulting in less compaction and healthier turf. The Jacobsen brand has led the way in the use of biodegradable oils and hydraulic fluids and in providing a wide range of environmentally friendly products. In addition to helping you select the right machinery, we also provide onsite servicing and repairs. You can see our range of Ransomes Jacobsen turf care machinery, or talk to one of our knowledgeable staff about your requirements, at one of our branches in Kent, Essex, Cambridgeshire, Hertfordshire, Suffolk, East Sussex, West Sussex and Surrey.